Jerome will never win a “most cheerful Saint to hang out with” competition, but I still want to discuss linguistics with him. Jerome’s parents were Christian, but he himself started out pagan and had a truly top-notch classical education which left him quoting Cicero and Virgil all his life. He enjoyed the traditional wanton youth that wealthy Romans so often enjoyed, then converted, and plunged himself into repentance and guilt. Thereafter his primary activities were visiting catacombs to contemplate death, spending time alone in the wilderness contemplating death, and writing. His life was dominated by a conflict between his profound love of the Greek and Latin classics, and deep shame that he still loved something he now considered wrong, corrupt and sinful. He supposedly vowed at one point to never again read a non-Christian author, and there are anecdotes of him being repeatedly distracted mid-devotion by an overwhelming desire to read Cicero, particularly as he slogged through the rough and clumsy Latin of early Christian authors. Jerome attempted to conquer this desire through mortification of the flesh (hence the paintings of him beating himself in the chest with a rock), but eventually determined to help others and himself by translating Christian texts into elegant Latin, so those who, like him, craved gorgeous prose could sate themselves, and not be tempted, as he so constantly was, to sneak some classics between sermons. 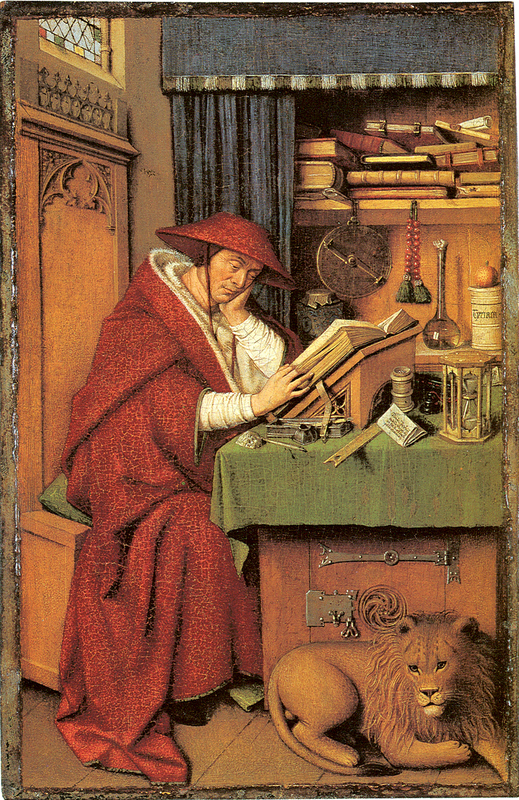 This made Jerome not only a founder of the Medieval literary canon, but a model for later authors, especially in the Renaissance, who wanted to figure out how to balance enthusiasm for Ovid and Homer with their Christian faith. He was also a model for monks and hermits, since he was so dedicated to the hermetic life that even when he was made a bishop it was only on condition that he could continue to live in the wilderness contemplating death and writing alone. While he is not patron of any particular monastic order, he appears frequently in monastic art as a general role model and core author of scholastic education. Jerome’s lion sits patiently as he contemplates the Ablative Absolute. In addition to translating and collecting texts, Jerome took part in heresy fights, and wrote powerful and far-reaching pamphlets against the heresies of his day, like Origenism and Pelagianism. Sometimes his activities were so effective that he got in trouble. In Rome, for example, he convinced a few too many eligible young aristocratic ladies to become nuns, and was eventually driven out by families angry at losing the chance for politically advantageous marriages. He left Rome for Antioch, but even here occasionally stirred up the odd angry mob when he wrote too fiercely against a rival sub-sect. As I write it out here, his story is not particularly remarkable for a saint’s life, and he doesn’t have an exciting martyrdom or particularly flashy miracles. What he does have is something far more unusual: a meaningful scholarly presence that is still discussed today by theologians and, more broadly, by historians. Here Jerome has no beard, and is wearing his robes, and has a nice office instead of a cave and a rock, but he still has the telltale lion and industrious attitude. 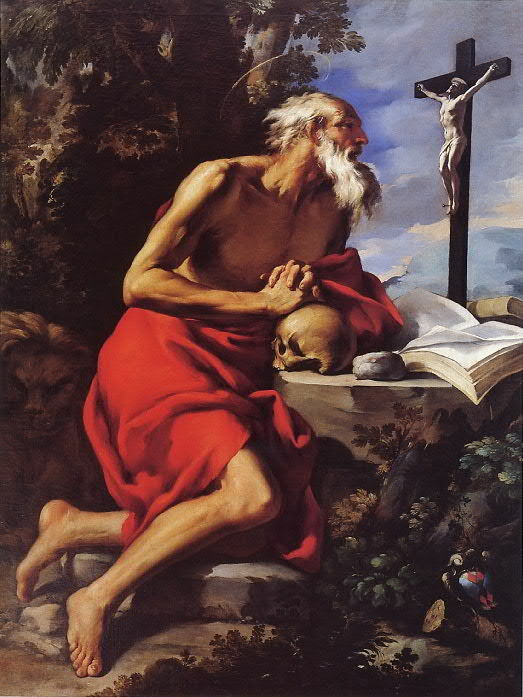 In my daily work it’s common enough for me to be reading about Saint Luke, or Saint Bartholomew, or Saint Francis, to be studying their iconography, their followers, their influence, but with Jerome it’s different. Jerome I look at as a source, and an interpreter: what he says about the date of a certain figure’s death, what he thought about the causes of a particular intellectual or political rift, comparing his reading and interpretation with those of other historians of his and later eras including our own. Even with someone like St. Augustine I’m usually studying his ideas, not consulting his guidance in studying someone else. Jerome is a secondary source, in essence, a predecessor and colleague of current historians, while the others are all primary sources, or, for those who left no writing, topics rather than sources at all. It makes Jerome feel strangely more human, and I admit that I almost always forget to put the “Saint” in front of his name. 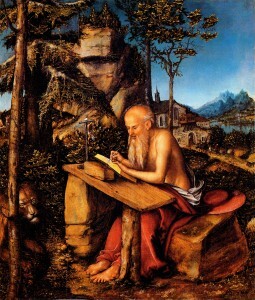 In art, Jerome is invariably depicted as a scrawny old man, almost always bearded. He usually has his flat red Cardinal’s hat discarded on the ground somewhere nearby, but is wearing only a loincloth, or his red robes pulled down so as to work like a loincloth, leaving his care-weathered torso bare. Occasionally, though, he is depicted in his full red robes, particularly when he is standing around among other saints, instead of off in the wilderness. There is a legend that Jerome removed a thorn from the paw of a rampaging lion, and so tamed it. He is often accompanied by his lion, making it easy to mix him up with Saint Mark, especially since both of them usually have beards and books. Rule of thumb: look for the cardinal’s hat. If there is a cardinal’s hat and the lion has no wings then it’s Jerome. If there is no hat, and the figure is wearing apostolic robes (i.e. a colorful toga-like drape), or if the lion has wings, then it’s Mark. Sometimes St. Jerome is depicted at work being visited by angels, or hearing an angel blow the trumpet of the Last Judgment, which is often awkwardly framed so it looks like an angel blowing a horn in Jerome’s face. Jerome is one of the original “Four Doctors of the Church,” and is often depicted with his three comrades, Saints Augustine, Ambrose and Gregory the Great. I will discuss the set of four in another entry, but it means that if you ever see a set of four saints of which two have bishop hats, one has a papal tiara, and the fourth has a cardinal’s hat, you’re probably looking at the four doctors, and the cardinal is probably Jerome. Especially if he looks like he might be thinking about Cicero. 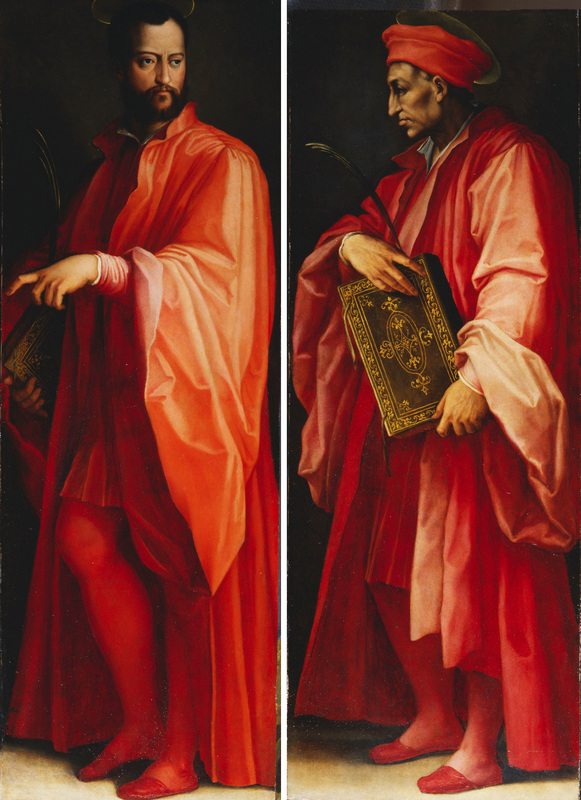 Cosmas and Damian are precisely the sort of saints that are not secondary or primary sources. They are supposed to have died around 287 AD in Roman Syria, and effectively count as one saint despite there being two of them, since they are twin brothers who did everything together, including being martyred. They were doctors, specifically surgeons, and are supposed to have worked for free for the poor. 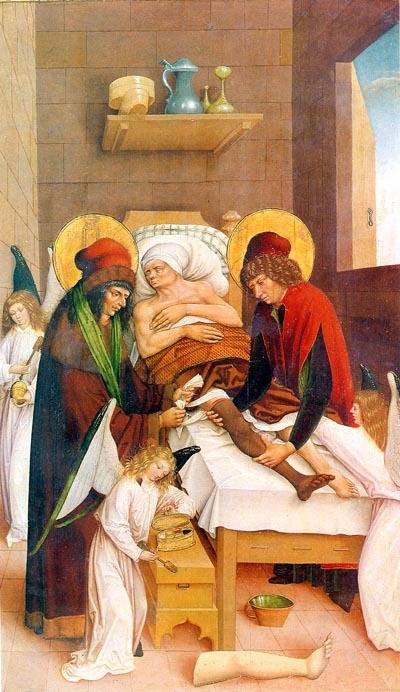 Their most celebrated miracle was a miraculous leg transplant, from an Ethiopian (dead) donor onto a (presumably) Syrian or Roman patient, depicted in art with a very dark leg being transplanted onto a pale patient. The historical pattern of Christian persecutions in the Eastern Roman Empire involved periods without much persecution followed by acute bouts of it, usually brought on by political pressures or the need to vent public dissent on a scapegoat. The persecution of Diocletian fit this pattern exactly, and it was from this particularly massive and nasty one that Cosmas and Damian’s martyrdom story arises. The full account says they were tortured but refused to give up their faith. They were first hung from crosses for a while, then shot with arrows, and finally beheaded. Some accounts have them beheaded along with a number of younger siblings, or possibly orphans they were caring for. Cosmas and Damian being sentenced in the persecution. When painted, Cosmas and Damian usually seem to be in their thirties or forties. Their most reliable attribute is that they have matching hats, usually distinctive round red hats. These are presumably doctors’ hats, and they generally wear red robes with them. This is only a semi-reliable tell, however, since those hats and robes are actually just how Florentine doctors dressed, so it only holds true in Florentine paintings of them. I remember going to Venice and seeing them in green and going “What the? !” But since they aren’t depicted very often except by artists on Medici payroll, they usually look Florentine. Other attributes–pill boxes, medical tools, medical spoons–are less reliable. The easiest tell, of course, is that there are always two of them. I found that after a few months in Florence I picked up the inexplicable capacity to recognize Cosmas and Damian in paintings even when they had no attributes at all. I would say it’s proof that I’ve been in Florence too long, but you can never be in Florence too long. And now, Spot the Saint quiz time! There are ten figures in this one. 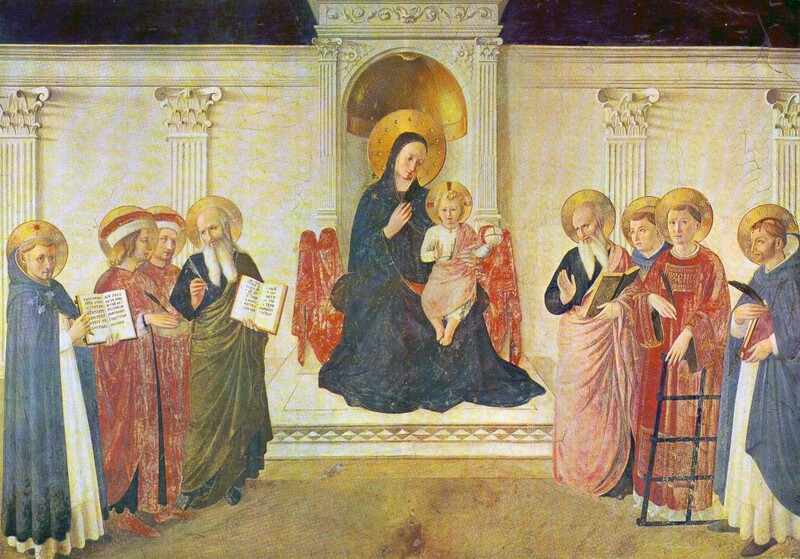 You can identify eight with certainty, and the final two you should be able to identify categorically as being a specific type of saint, and you can be sure of one of them from the fact that this was painted in a monastery called “San Marco”. If you could read the text on the book you’d also get the last one. You should also be able to tell who forked over the cash, and what order of monks it was made for. Skip to the next Spot the Saint entry: the Four Doctors and Saints’ Hats. 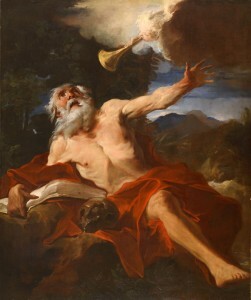 The Assumption of Saint Jerome. Certainly. From left to right they are: St. Dominic, Sts. Cosmas and Damian, an Evangelist likely Mark (one could tell for sure by reading the Latin in a better photo), Mary and the Christ Child, then a second Evangelist likely John, then Thomas Aquinas in the back, St. Lorenzo, and on the far right St. Peter Martyr aka. 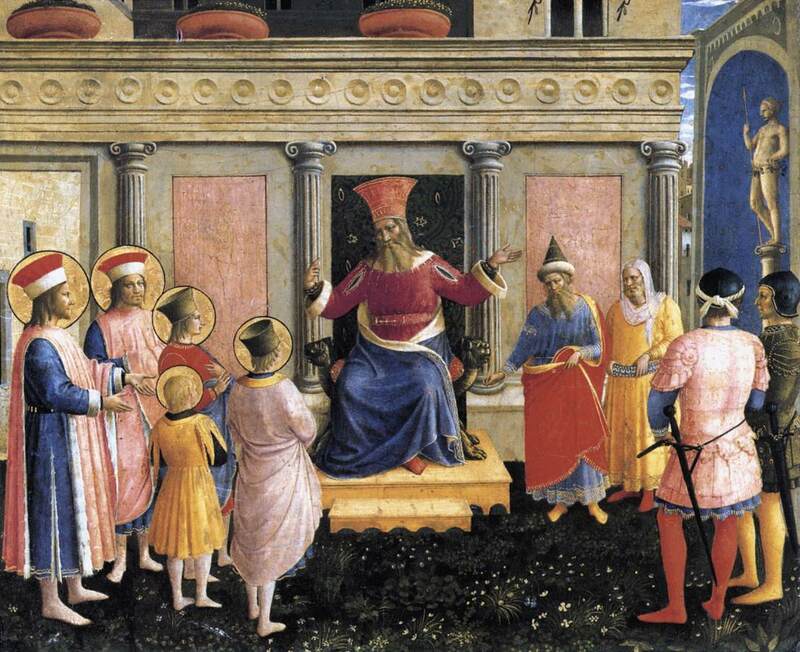 Peter of Verona. This painting is, in part, an exercise in realizing when you can’t get more specific – the Evangelist to the right of Mary is clearly an Evangelist but has no accompanying symbolic creature, so can’t be narrowed down beyond that. “Know when it’s impossible to tell” is a key skill in Spot the Saint. 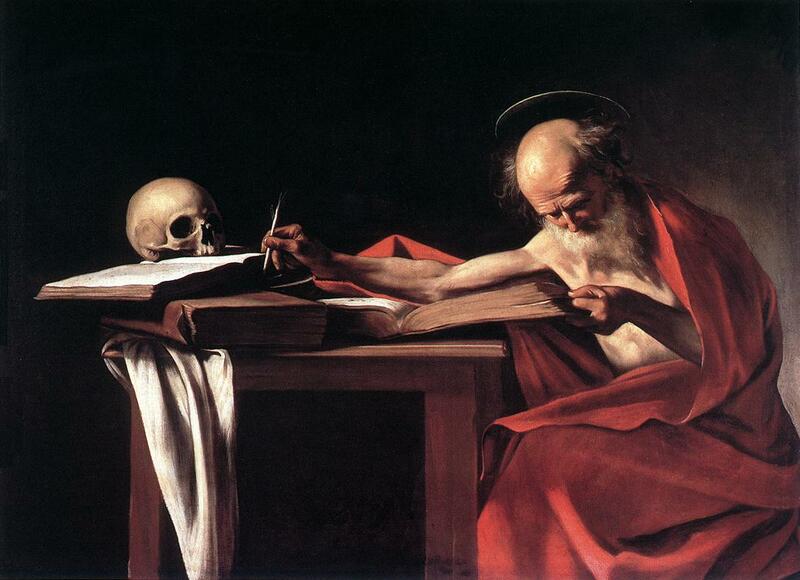 Can you tell me who the artist is for the first St. Jerome painting? Thank you! Based on the file name, Alessandro Gherardini.